If this is a T-shirt, I need it in my life. It is! 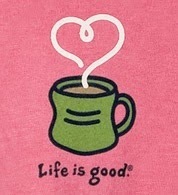 On Amazon search life is good mug in clothing...and viola! Too cute! Whee! I'll have to let Mr. W know. My b-day is coming up soon. :) Thanks, Kristin!